One of two flying B-29 bombers has landed in Canada for an extended tour. 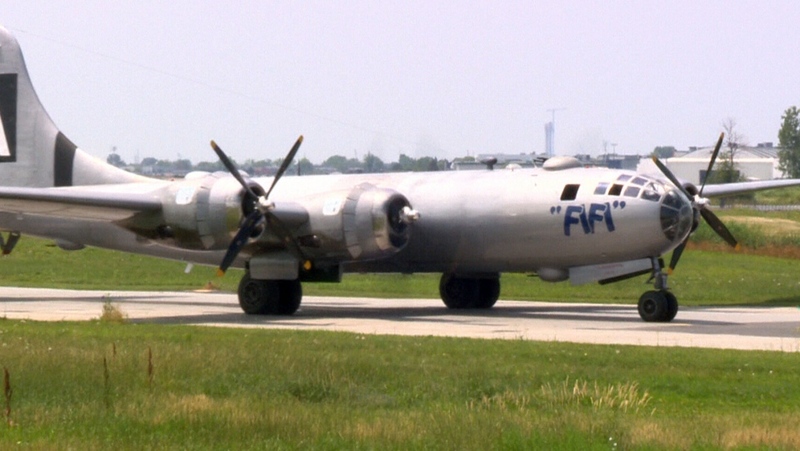 Fifi, the Superfortress owned by the Commemorative Air Force has spent the last week at St. Hubert, outside Montreal, giving rides to enthusiasts looking to step back in time. The aircraft is the same type used to drop two atomic bombs on Japan that ended the Second World War in 1945 and has been faithfully restored to reflect that era. Although the aircraft seems like a ponderous and slow relic of the past, it was state of the art in its day and the result of the most expensive wartime development program of the Second World War. The aircraft is wrapping up its Quebec visit and will head for seven more stops over the next seven weeks. The iconic aircraft will be in Gatineau July 25-30, Peterborough Aug. 3-5, North Bay Aug. 8-12, Kitchener Aug. 13-15, London Aug. 17-29, Windsor, Aug. 22-26 and Hamilton Aug. 30-Sept.2. Fifi is expensive to run (about $15,000 an hour) so seats range from $600 in the back fuselage to $1700 for the coveted bombardier position. Last-Minute Save For Toronto Lanc?